This incident reflects an emotional event in Pagnol’s true life story and is recounted in the concluding two pages of the novel. .
Picture left – Joseph and Augustine Pagnol, overloaded with baggage, anxiously lead their children across the private estate of one of the four country houses, through which they trespassed as a shortcut to their holiday home. 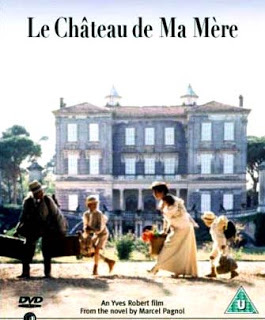 This DVD cover is for the film made by Yves Robert in 1990.